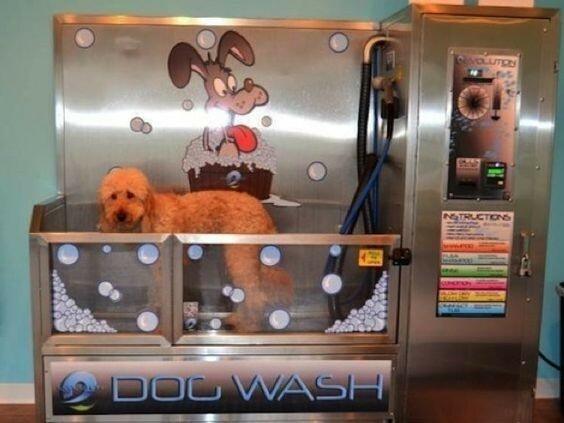 Hugely popular in America, the self-service dog wash is now on the rise in the UK. But you might be wondering what on earth it is and why should you use one? 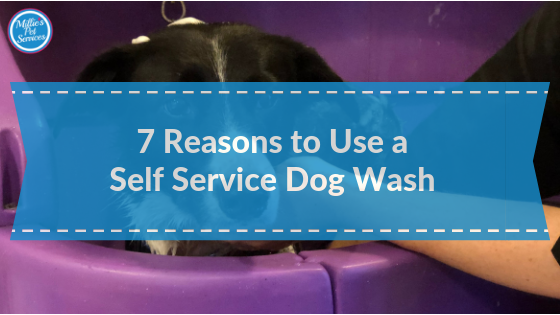 Apart from the obvious answer “to wash your dog”, here are 7 reasons to use a self-service dog wash. But, What is a Self Service Dog Wash? In really simple terms, these are businesses who allow you to use their facilities to wash and dry your dog. They tend to provide bathing facilities, shampoo, condition, sprays, towels and dryers. In some cases, they may also allow you to use clippers too. Typically there is a charge based on the size of a dog or you pay for the time you use, normally in fifteen-minute increments. However, as you are doing the work yourself this is typically around 50-60% of a full groom cost. The actual facilities themselves can vary greatly. There are now businesses that are set up 100% for a self-service dog wash and may even have several individual pods for you to use. You’ll even find coin-operated facilities are quite common in America! However, you will also find self-service available at some groomers who are looking maximise the use of their space while not in use by their grooming customers. This may be more ideal if your dog is reactive or needs that 1:1 space without other dogs. We’ve all been there. Our furiends may be looking super clean post their bath but there is mud and fur everywhere. While the bath can look pretty grim post a dog bathing session for some reason, you end up spending another hour cleaning the bathroom floor and tiles then any room you’ve used to dry them in! Plus you have that lingering wet dog smell too! With a self-service dog wash, you can literally walk out the door and leave the mess behind. Most self-service dog washes will provide all of the equipment, towels and dryers and they’ll happily tidy up after you and take care of the laundry too. When it comes to drying your dog, along with having access to a fast dry spray to prepare your dogs coat before drying, self service dog washes also offer professional dryers/blasters. These will drastically reduce your drying time. If you can dry your dog quicker, you’ll be able to spend more time brushing your dog as it’s only once dry that you will really see the dead hair start to come out. And if you have a curly haired dog, then using a professional dryer will help with de-matting and smoothing their coat too! A win-win-win? Most self-service dog washes will have bathing units that allow you to stand upright while bathing and drying your dog, though Id’ recommend checking in with them re their set up if this is a concern to you. While some self-service dog washes use stationary stainless steel units with ramps, personally, we use a height adjustable bath with a sliding door that allows your dog to access the bath easily and for you to adjust exactly to your own height. This ensures you don’t need to pick up your dog to put them in the bath as well as taking the pressure off during the bathing process. Our drying table is the same. This is also height adjustable taking the pressure off both you and your dog when transferring to the table. We may recommend that for some larger dogs they are dried on the floor post the initial drying in the bath, purely for their own safety. While our tables can take heavy and large dogs, our experience tells us, they find it more comfortable! You can meet Barney, our own bath, in the video below – though our own has a splashback! Bought dog shampoo a few months ago and now can’t find it or wondering if it’s gone ‘off’? Or do you have a larger breed of dog, who would take days to dry with a typical home hairdryer? Does your dog love to try and lunge out of the bath mid wash and your worried they’ll hurt themselves? Let’s not beat around the bush on this one. It’s an obvious benefit in that you are not having to pay for the time of a bather to wash and dry your dog. Instead, you are using your own time. Depending on the time you spend at a self-service dog wash, this can typically be 50-60% of the cost of a bath and brush appointment. Though it’s ultimately your choice whether you wish to fully dry or brush your dog while in the facilities. If you already have regular grooming appointments, you may not want the additional cost of bath and brush appointments in-between and thus using a self-service dog wash may be the ideal solution. And well, it’s the pawfect opportunity to bond with your dog 😉 They’ll forgive you for the bath afterwards….. I promise! If your dog has never been to a groomer, and is timid or suffers from anxiety, then slowly building up their exposure to this environment while in the safety of an owners presence can be beneficial. You can take it easy and build up to a full bath and blow dry over time and ensure that they are stress-free. It’s also the perfect opportunity to get advice and if based in groomers, then the chance to find out more about their services before you book. Not quite sure what shampoo will help restore their glossy coat or how many times you should shampoo them? Wondering which brush or comb will help de-matt those problem areas? Not sure how to get that ‘fluffy’ teddy bear look while drying? 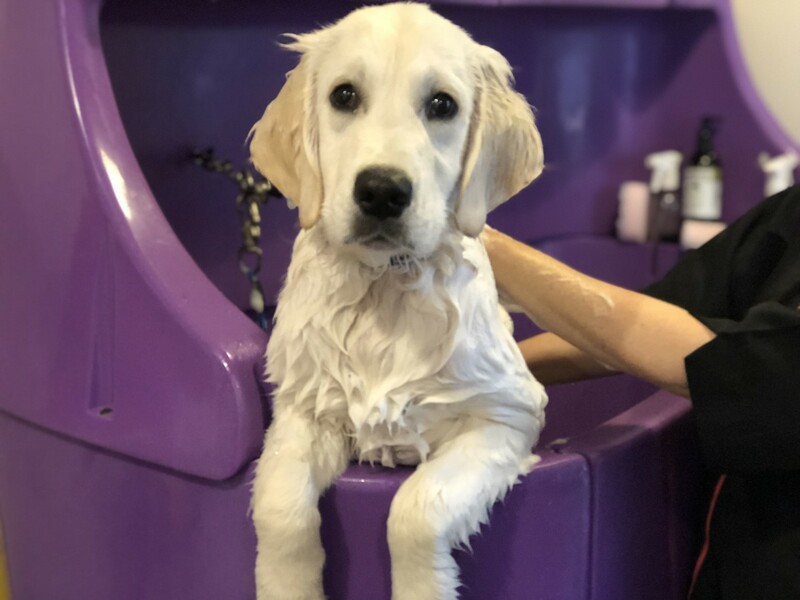 Some self-service dog wash businesses will have trained groomers/bathers on hand to provide advice throughout your appointment and will be happy to advise. However, staffing of a self-service dog wash will vary between businesses and worth asking pre-booking. Self-Service Dog Wash facilities are growing more and more popular and can be the perfect way to save some costs but getting that ‘salon finish’. It will take some time from you and while it should never substitute a full groom, can be a great way to bond and have fun with your dog. If you haven’t heard, then we will be opening up our own self-service dog washes here at Millie’s from the 1st April. Want to be the first to find out when appointments are released? Then make sure you sign up to our email list below or HERE to find out more.